The leadership crisis rocking Nigeria’s main opposition Party, the Peoples Democratic Party (PDP) took another dimension on Tuesday as counter orders restrained the parallel leaders from assuming the mantle of leadership of the party. In one case, a Federal High Court sitting in Port Harcourt granted an interim injunction restraining the immediate past National Chairman and National Secretary of the PDP, Senator Ali Modu Sheriff and Professor Adewale Oladipo from parading themselves as national officers of the party. But in a counter ruling, a Federal High Court in Lagos declared as invalid, the caretaker committee constituted to take over the affairs of the PDP from its acting National Chairman, Ali Modu Sheriff. 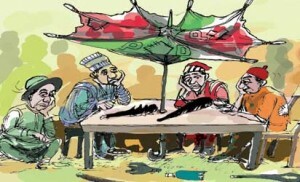 The Court sitting in Port Harcourt had issued its judgement first on Tuesday granting a restraining order on all members of the party’s National Working Committee from receiving nominations or submitting names to the Independent National Electoral Commission (INEC) as officers or candidates of the PDP in whatever capacity pending the hearing and determination of the motion on notice brought by the party. In a later ruling also on Tuesday however, Justice Ibrahim Buba of the Federal High Court in Lagos, ordered Ali Modu Sheriff, the erstwhile chairman of the party to continue serving as the party’s chairman. The Judge nullified the national caretaker committee constituted by the Peoples Democratic Party during last Saturday’s convention. The PDP is currently enmeshed in a leadership crisis, which culminated in two parallel conventions in Abuja and Port Harcourt on Saturday. The conventions produced three sets of leaders. While the party’s national officers led by former Borno Governor, Ali Sheriff, were sacked and an interim team announced in Port Harcourt, the Abuja convention appointed a former Deputy Senate President, Ibrahim Mantu, as acting national chairman. The convention in Port Harcourt appointed former Kaduna Governor, Ahmed Makarfi, as chairman and a former senator, Ben Obi, as National Secretary. The party said the acting national officers would be in office for three months. The PDP is Nigeria’s biggest opposition party, and was defeated only in May 2015 after holding power for 16 years.